More than 200 children participated in a Children’s Festival at St. Michael Parish in Wauchula. Geared toward children aged 3 to 10, there were a number of fun activities and games as well as Mass and prayers. 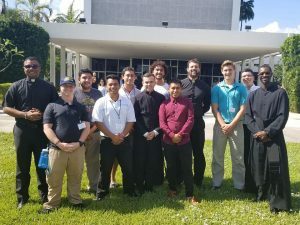 The Diocese Vocations Office brought a group of young men to participate in the Nov. 9-11 Vocations Awareness Weekend at St. John Vianney College Seminary in Miami. Led by Vocations Director Father Eric Scanlan, several attended this engaging and prayerful discernment event. 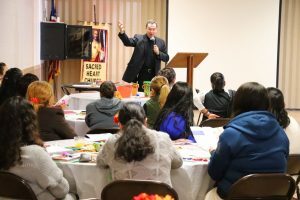 A Diocesan Catechist Retreat themed: “Root of God’s Healing” took place Nov. 17 at Our Lady of Lourdes Parish. About 100 catechists participated in the retreat which focused on reenergizing them as they approach the Advent and Christmas seasons. They were reminded that Jesus serves to free and restore them as they work to be the light and witness of the Lord for others. 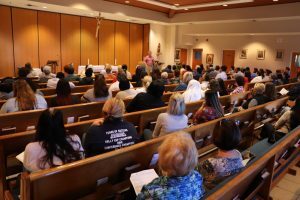 The first ever Venice Diocesan Council of Catholic Women Latina Convocation took place Nov. 17 at Sacred Heart Parish in Bradenton. About 50 women took part in the gathering which served to educate about the role of the CCW and to inspire them to become more involved in their faith. Iris Gomez, VDCCW Past-President, organized the gathering and Father Juan Carlos Sack, Administrator at Sacred Heart Parish, provide inspirational talks. Praying for the end to the death penalty, a Cities for Life gathering was held Nov. 30 at St. Charles Borromeo Parish in Port Charlotte. Cities for Life is a worldwide annual event that was begun in 2002 by the community of Saint’ Egidio in Rome where the Coliseum was lit up during the night. November 30th was chosen because it is the anniversary of the first civil state in the world to do away with the death penalty in Tuscany, Italy in 1786- 229 years ago. About 2,000 cities and 80 countries will call for the end of the use of the death penalty by lighting civic or religious buildings around the world, along with prayer services and educational programs. 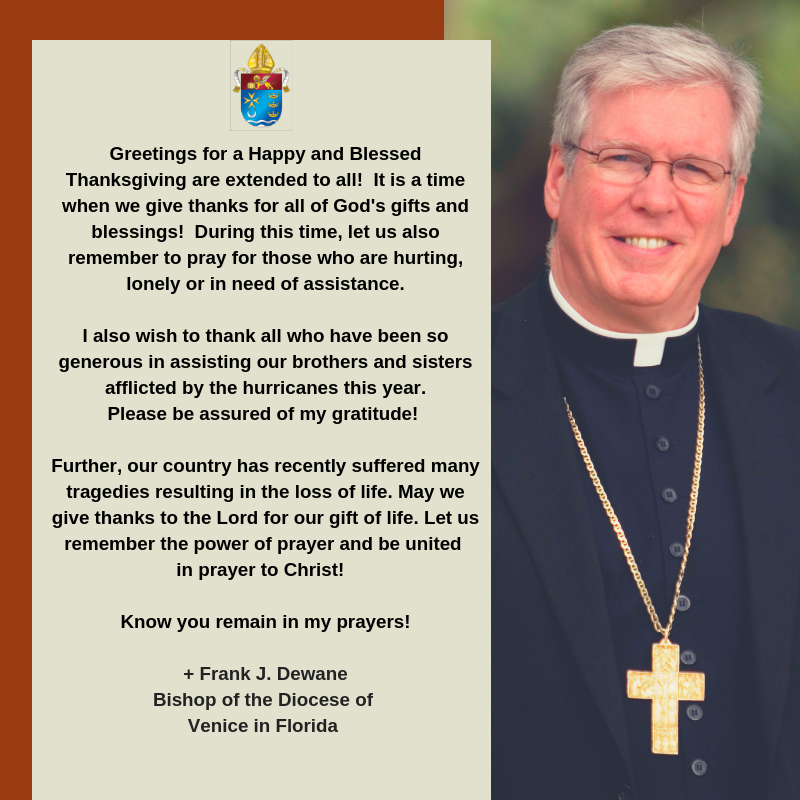 This was the fourth time the Dioceses of Florida participated in the prayer vigil. 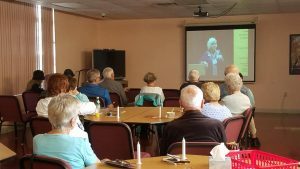 Participants in the Port Charlotte gathering saw a video presentation of a talk on the death penalty from the September 2018 Florida Respect Life Conference in Punta Gorda. The Catholic Charities Ball will be held on Jan. 26, at 6 p.m. at The Westin in Sarasota. All proceeds will benefit the programs and services of Catholic Charities, Diocese of Venice, Inc. in Sarasota and Manatee counties which include Our Mother’s House, St. Martha’s Early Learning Center, Bethesda House, Catholic Charities Family Haven, housing counseling and foreclosure prevention, financial assistance, senior services, professional counseling, refugee services, and immigration services. The evening will include a cocktail hour, auctions, dinner, and dancing. Tickets are $300 a person. For information and tickets visit www.catholiccharitiesdov.org or call 941-355-4680, ext. 301 or email nmuth@ccdis1.org. 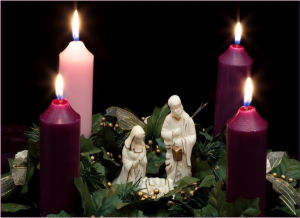 Advent Reflections – Advent is a time of reflection and spiritual growth. The original practice of Advent was a period including 40 days of fasting which began after the Feast of St. Martin. Since then, Advent has been shortened to the four weeks we know it as today. Attached you will find a spiritual reflection for each day of Advent. These reflections focus on the true spiritual preparation for Christ’s coming at Christmas including prayer, fasting, almsgiving, and the life of the Church. Feel free to share them on your websites, in your bulletins, social media, and with your family and friends. Let us all come together to “Prepare the way” of the Lord this Advent and truly celebrate this beautiful liturgical season. Venice – Epiphany Cathedral in Venice was illuminated in red Nov. 28 as the Diocese participated in the “Courage in Red” initiative to shine the light on the plight of persecuted Christians. In addition to the illuminating of the Cathedral, a variety of activities took place throughout the Diocese in support of the “Courage in Red” initiative. The various initiatives are part of a worldwide “Courage in Red” campaign by Aid to the Church in Need (ACN), the international papal charity that provides pastoral and humanitarian aid to persecuted Christian communities. In a recent report by Aid to the Church in Need on Religious Freedom, it found that some 61 percent of the world’s population live in countries where religious freedom is not respected. Among them are almost 300 million Christians, or 1 in 7, who live in a country of persecution, subject to violence, arrest, and human rights violations. An evening prayer vigil was held at Epiphany Cathedral which included prayers, Adoration and Benediction. Led by Father James Shea, he spoke about how the persecution of Christians started with Jesus Christ, who suffered and died on the Cross. On Nov. 28, Diocesan Catholic school students wore red in solidarity with persecuted Christians and participated in age-appropriate activities to learn about their plight. Several schools held prayer services focusing on the suffering and martyred Church throughout the world. Cardinal Mooney Catholic High School students in Sarasota also watched the new documentary “Christians in the Mirror” which compares and contrasts the plight of persecuted Christians in the Middle East and Africa in contrast to other Christian Churches which live in relative peace. 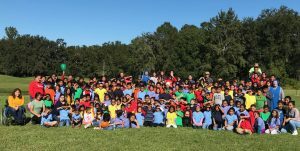 At St. Martha Catholic School and St. Mary’s Academy in Sarasota every student wore a red uniform shirt and a red ribbon in honor of those being persecuted for their faith. Each student also created a card of support for persecuted Christian children to send them to those in the Holy Land. Each class prayed one decade of the Rosary in chapel during that week for a county in the Mission Rosary where Christians are being persecuted.